The Adelsons are the biggest donors this election cycle, with at least $87 million given to GOP super PACs. The president raised more than $18 million last quarter through three committees. Trump disputed moderator Lester Holt's claim that stop-and-frisk was ruled unconstitutional. Holt was correct; Trump was not. 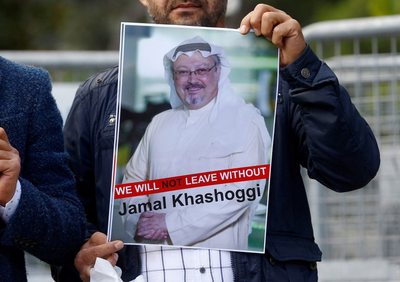 Two people with knowledge of the probe said Turkey believes Jamal Khashoggi was killed after in the Saudi consulate in Istanbul earlier this week. Saudi officials have denied any link to Khashoggi’s disappearance. GOP groups are making a last-ditch effort to prop up Rep. Marsha Blackburn, a Trump ally. We at The Post won't be able to rest easy until our colleague appears safe and sound. The Senate hopeful, in a debate, earns Four Pinocchios for flatly disputing a witness account in police records from his DWI 20 years ago. Transparency advocates lauded the decision but said groups will find ways to skirt the new regulations. Donors are cutting seven-figure checks to the super PAC backing Senate Democrats, in a sign of intensifying hopes on the left of flipping control of the chamber. Sen. Mazie Hirono has emerged as a leading critic of the GOP’s handling of Christine Blasey Ford’s allegation against Supreme Court nominee Brett Kavanaugh.